Grand Opening of Harris Teeter Store in Williamsburg, Va.
Harris Teeter to celebrate grand opening of Williamsburg, Va. location with ribbon cutting ceremony. 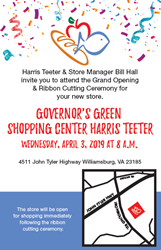 Harris Teeter is proud to welcome shoppers to its Governor’s Green Shopping Center location on Wednesday, April 3, 2019 at 8 a.m. as the company celebrates its grand opening with a ribbon cutting ceremony. This location is the fourth of the former Farm Fresh stores Harris Teeter purchased in May, 2018 to open under the Harris Teeter banner. The store will feature signature Harris Teeter amenities including ExpressLane Online Shopping, a hot foods bar, salad bar, a sub shop and fresh sushi. In each of its stores, Harris Teeter strives to offer customers an excellent shopping experience, which begins with customer service and features high-quality products, variety and selection. Harris Teeter also works to be a true community partner by supporting local schools and youth sports organizations, among other non-profit organizations. Pharmacy Hours: Mon. - Sat. 9 a.m.-9 p.m.; Sun. 11 a.m.-6 p.m.